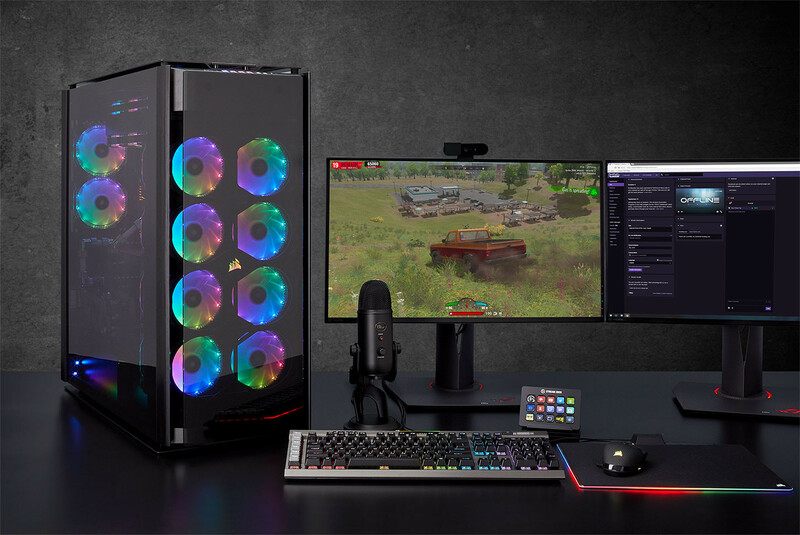 CORSAIR , a world leader in PC gaming peripherals and enthusiast components, today announced the launch of its largest, most feature-rich PC case ever - the Obsidian Series 1000D. Building on the CORSAIR Concept Slate prototype that captured the imagination of PC enthusiasts, the Obsidian 1000D is the result of over two years of development and design to create the ultimate super-tower case. 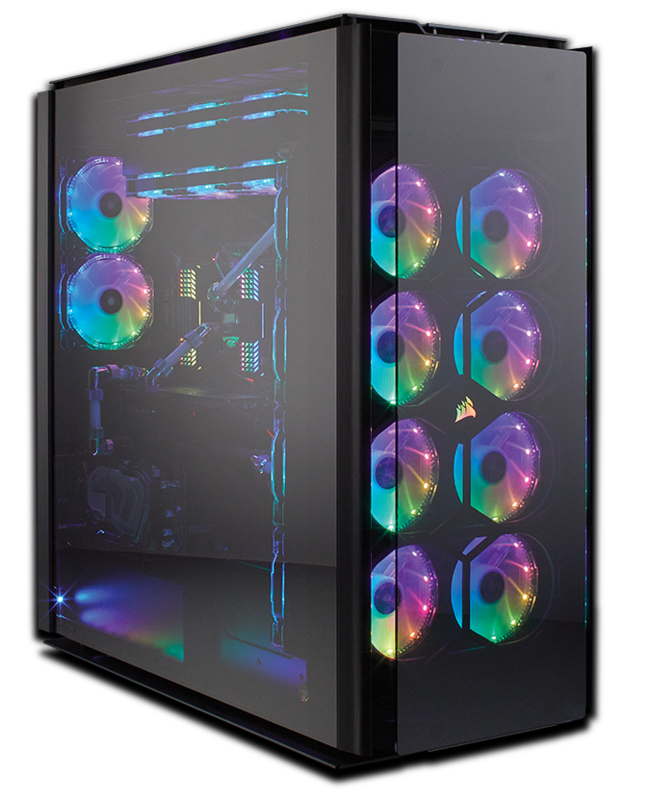 Clean exterior lines brushed aluminium details and four smoked tempered glass panels give the 1000D the iconic styling and superior build-quality enthusiasts have come to expect from the CORSAIR Obsidian Series. Both a full E-ATX and Mini-ITX system can be installed simultaneously, cooled by 13 cooling fan mounts, powered by two PSUs (SFX and ATX) and equipped with 11 storage drives. Created to house the world's most epic PC builds, the 1000D is the ultimate super-tower PC case. The 1000D is designed to house the most powerful, ambitious and jaw-dropping PCs on the planet, contained in a unique triple-chamber, dual-system layout. The primary E-ATX system is mounted on a raised motherboard island, lined by convenient cable routing holes and backed by a huge French-door-style rear compartment to easily hide away 2.5in drives, cabling and accessories. The Mini-ITX system sits rotated above the ATX PSU mount, providing an optional fully-equipped system to run as a file server, streaming capture system, or second gaming PC for player two. With two systems worth of hardware to handle, the 1000D boasts a huge array of cooling options. Eight 120mm fan mounts to the front, three 140mm fan mounts in the roof and two 120/140mm fan mounts to the rear have the headroom to mount even the thickest liquid cooling radiators with fans in push/pull configuration. Fitted using replaceable telescoping fan trays* that make installation easy, the 1000D can equip up to 18 cooling fans and four 480mm liquid cooling radiators - the most liquid-cooling friendly CORSAIR case ever. To power the huge array of cooling hardware it can carry, the 1000D includes a CORSAIR Commander PRO digital RGB lighting and fan speed controller, granting users precision speed control of up to six PWM fans, and lighting control for up to six CORSAIR RGB fans or CORSAIR RGB LED strips. The 1000D itself also boasts integrated RGB lighting, built into its front panel and front logo, as either a starting-point for a stunning RGB build, or as a subtle accent to your system. Whether you go all-out on lighting or are building a more reserved system, CORSAIR iCUE software brings everything together, combining RGB lighting control for all iCUE compatible products including fans, RGB LED light strips, keyboards, mice and more. iCUE also provides in-depth customizable fan RPM curves to silence fans, downloadable profiles and advanced system monitoring, all controlled with a single easy-to-use interface. Look closer behind the monolithic design and epic capabilities, and you'll find that the 1000D is loaded with extras to make building your system easy and ready for years of upgrades. The front panel offers dual USB 3.1 Type C ports, as well as four USB 3.0 ports, for multiple high-speed connections. Front, rear and roof removable dust filters ensure your system stays looking its best, while a rotatable GPU mount plate for the primary system lets you put your graphics card on show. When installing liquid cooling, you'll find a wide variety of pump and reservoir mounting points, with an exhaustive array of screws and cable ties included to add the finishing touch to your system. Able to easily house today's most ambitious systems, cool them with room to spare, finish them with fine attention to detail and light them with stunning, or subtle, RGB lighting, the 1000D is the ultimate super-tower case. And you'll need a crane to move it once it's filled. Holey crap Marie! you got that right cause I'm not expecting anything practical . 12 year old first time builder is now the enthusiasts expecting and wanting something like this so to wow his friends and play with the lighting . or to be used for a circus or carnival display ? ''the result of over two years of development and design to create the ultimate super-tower case '' back to 12 year olds I guess are the design engineers ? This case is totally worth for those who like to populate plethora of rads. And then completely choke any airflow with glass panels. 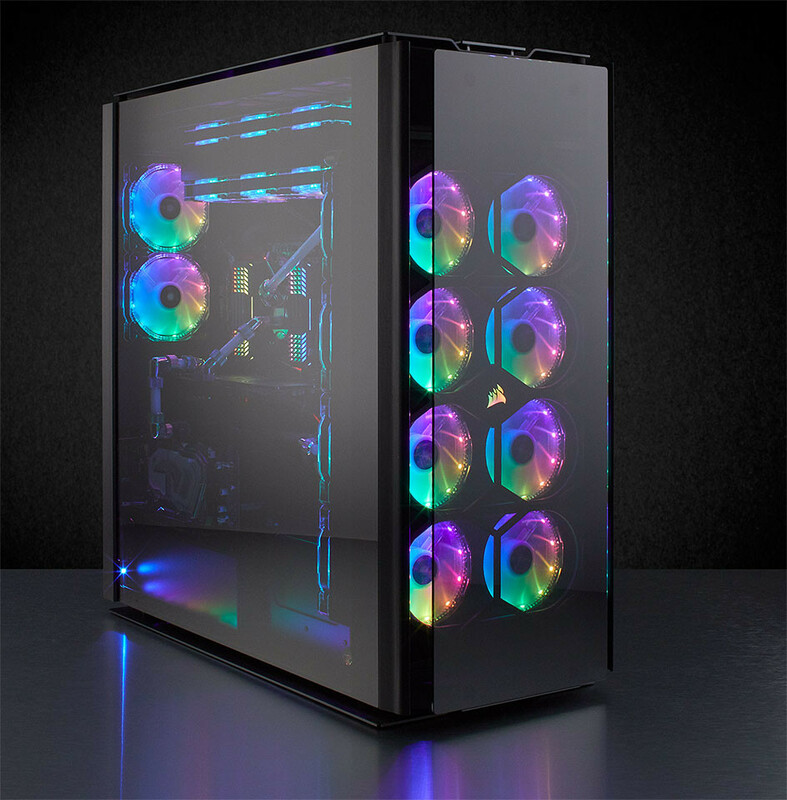 If this case didn't have all the stupid RGB fans and tempered glass, I'd want one. 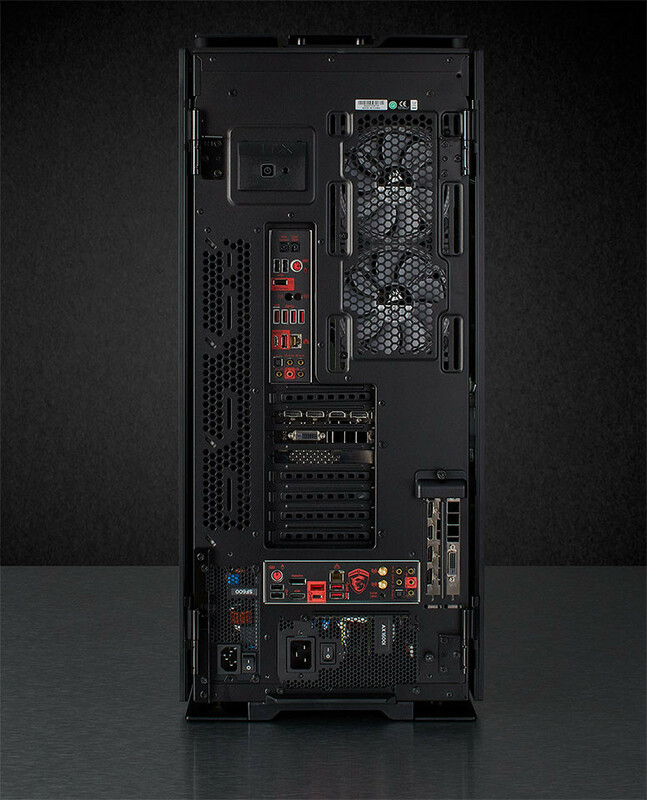 I can see having two motherboard mounts being really useful (like a main PC and a rendering/editing PC in the same tower). I prefer a mix of practicality and style (leaning more toward practicality) rather than one or the other. I'd choose a case with a big front air intake over one with slits on the sides of the front panel. 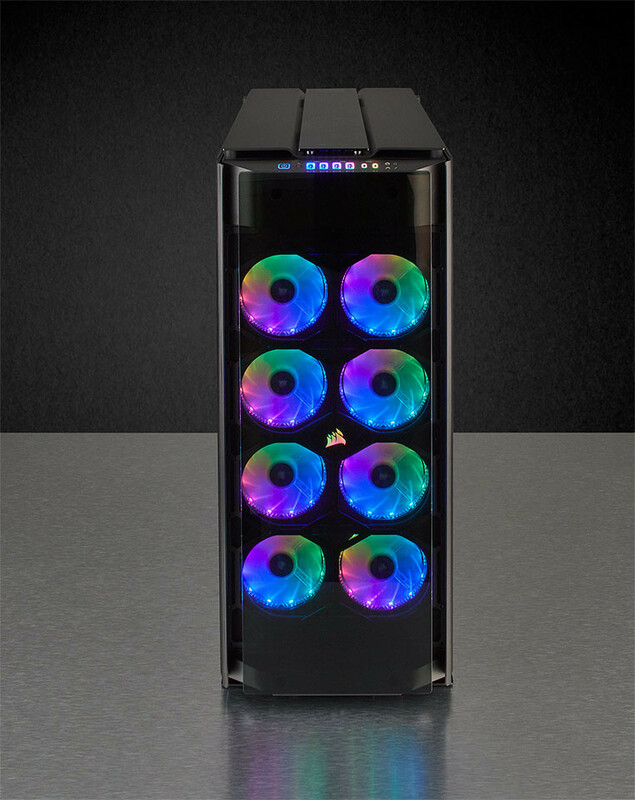 Case comes with no fans per the product page..... Actually kind of surprised for the cost of the case that they wouldn't include a few fans since it can house up to 18! There's a huge gap between the front fans and glass. It's pretty significant and doesn't affect intake. Also - for all you RGB haters you'll be pleased to know the fans are not included, so you can install whatever fans you want. There is, however, an included Commander Pro so you can control up to six fans (DC or PWM), plus any RGB lighting strips or fans you decide you may want to install eventually. The logo and I/O panel backlighting are software controlled RGB so you can choose what color it is (or turn it off if you want). kinda like the guy said above no fans ? whats next motherboard tray sold separately, no standoffs included , and drive bays optional as well ? when you buy a case you expect ready to go not darn I got to go back to newegg and get the fans for it at added cost on top of the case's cost ..
seems like they could offer a LED fan packaged case and a non- led fan packaged case . just check the one you want at cart ..
That's something we're looking at doing on the website - custom bundles, you pick which fan (ML series? LL series? HD series? 120mm? 140mm?) you want....but that's a ways off for a couple reasons. We pulled the fans out of 1000D because feedback from the guys buying cases in this price range said that they almost always threw away whatever "cheap crappy fans" came with the case and bought their own, or that they wanted us to include "high quality, high performance fans" but they differed in what that meant (Magnetic Levitation bearings? RGB lighting? Static Pressure fans?) so there's no consensus. I think pulling the fans gave us the flexibility to include some other cool things like the Commander Pro, the slide-out radiator and fan trays, the extra tempered glass accent piece on top, etc. But we'll see. It's a risk. First case we've ever launched without fans. Ask me again in a few months and I'll tell you if it was a good decision or not, heh. 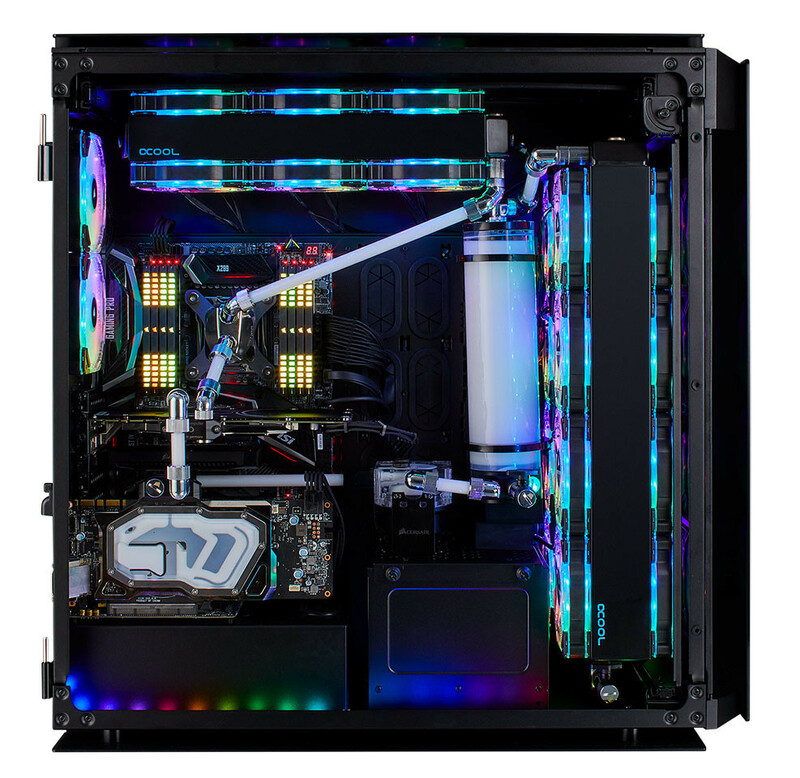 The interior pic that shows all the fancy, colorful hardware.....the reservoir isn't level and it bothers me. That is all. Move along. see what you just said ? think on that . so why are your better or best fans not in it at that ''price range '' ? then a case in that price range with low buck thumb screws not a nice quick and easy to use latch and hinged swing out panels . thing is it like no one builds a solid well built practical case . its all this crap hype and gimmicks . funny I was thinking I could get a glass acrylic panel cut for a side panel for it and drill and cut out for the latch and hinge for it as well /cheap. Once the price drops a bit, my next case. My 800D it´s starting to get "old"
Something I don't see mentioned is the weight of this beast. According to the specs the weight is 29.5kg (that's 65 pounds)! Cripes all mighty. I thought the CM Cosmos 1000 I used years ago weight a lot for what it was, but only coming in at 16.9kg (37.25 pounds) it's just a baby compared to this monster. After having a SLI build in that Cosmos 1000 case the weight would be pushing 50 pounds or so and that still less than the empty Obsidian 1000D. I hated when I had to move the tower the couple of times I had to because you know, the wife wanted to rearrange things and shuffle furniture. "Both a full E-ATX and Mini-ITX system can be installed simultaneously"
I think you have it about right.